Whether you are coming to Orr Chiropractic because of aches and pains, a feeling of weakness in your body, or a desire to improve your physical fitness and wellness, the PowerVibe Whole Body Vibration Therapy is ideal for any new or returning patient. At Orr Chiropractic Center, we help serve all of mid-Ohio’s health needs naturally and in all aspects of your life. Our mission is to help you achieve your own personal goals and we are here to customize our service to fit those needs. When you come into our Pataskala office or give us a call, we can help fine tune what treatment path might be right for you. Whole Body Vibration technology originated in the 1960s during the time of the space race in order to reverse the affects of a loss in bone density and muscle atrophy. It was at this point that scientists discovered some of the benefits the vibrations contributed to exercise regiments and muscle reactions. The PowerVibe Whole Body Vibration can be used in multiple ways. Our primary use at Orr Chiropractic Center for the PowerVibe Whole Body Vibration Therapy is on a more simplified level in combination with our typical chiropractic adjustments. This involves lower levels of physical activity on the machine and is used more for stretching. The second main use for whole body vibration is for training purposes. When used as a training tool, the machine is a piece of equipment to be used to perform exercises and activities on to build up strength and enhance weight loss. 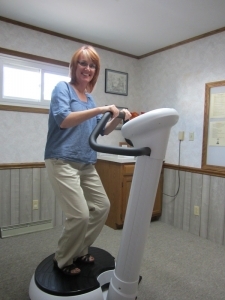 One of Orr Chiropractic’s unique therapy options helping a variety of patients is the PowerVibe Whole Body Vibration program. By using the PowerVibe Whole Body Vibration machine your weight is being distributed in various combinations of small motions. Each of these tiny shifts in weight can increase movement, circulation, flexibility, energy level, and bone density within your body as well as enhance wellness, strength, detoxification and rehabilitation. By loosening up muscles and awakening parts the body that had been tense, weight loss, reduction of cellulite, and reduced varicose veins are possible results. Our goal is to use this machine to give your body the strength to do more, whether that be fight off illness, allow you to exercise more fully, or just settle your everyday tension. Learn more about some of the great stretches and exercises you can do during a PowerVibe Whole Body Therapy session by viewing PowerVibe’s videos here! If you would like to test out our PowerVibe Whole Body Therapy treatment, contact Dr. Julia and her staff at Orr Chiropractic Center of Central Ohio on our website, or by phone at 740-927-7026.